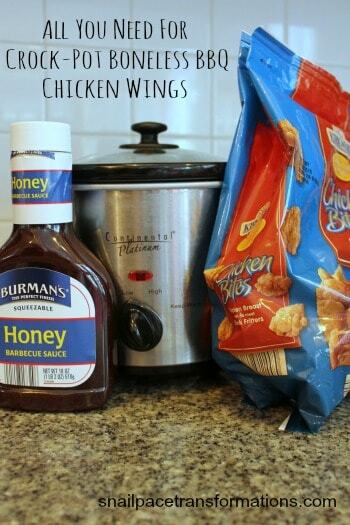 My recipe for Crock-Pot Boneless BBQ Chicken Wings all started with a conversation between my husband and me at our favorite wing joint. 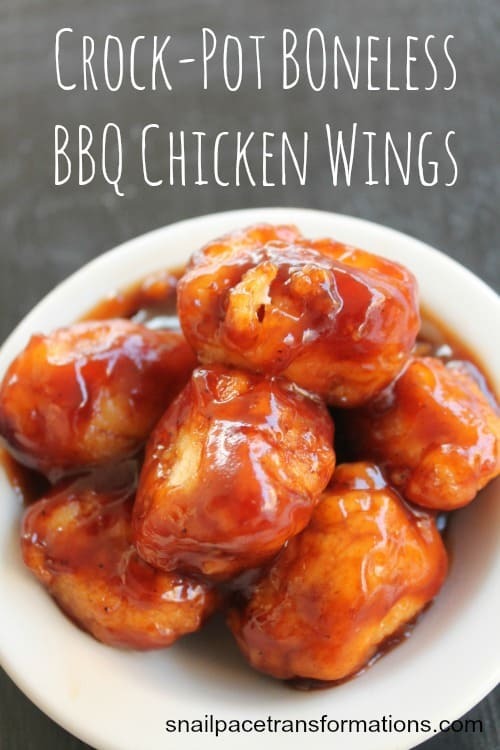 We both prefer boneless wings, and it occurred to us we could probably make the same thing at home using our crock-pot, a bag of chicken bites, and a bottle of BBQ sauce. A few months later, I was getting tired of Friday night feeling like every other night. 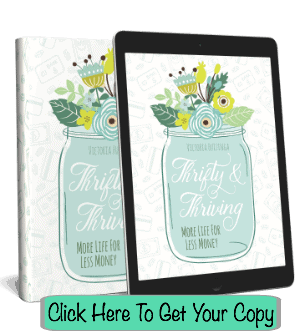 I had a strong desire to do something on Friday nights that would set it apart from the rest of the week and make it something to look forward to again like I did when I was much much younger (like before children ). Out of that desire, crock-pot boneless BBQ chicken wings and a Redbox movie night was born. The kids, don’t typically join us. First, they don’t want to wait that long for dinner since my husband isn’t home until 8 pm most Fridays, and second, they don’t want to see their parents snuggling and kissing. I eat a generous snack at 4 pm so I can hold out until 8 pm, and it is always worth the wait. My hubby and I both look forward to wing and movie night now. This recipe for crock-pot boneless BBQ chicken wings is more processed than a lot of my recipes, but our family follows an 80/20 diet of whole foods to processed foods. This balance allows me to feel like I am not always in the kitchen and helps me avoid takeout which saves money. 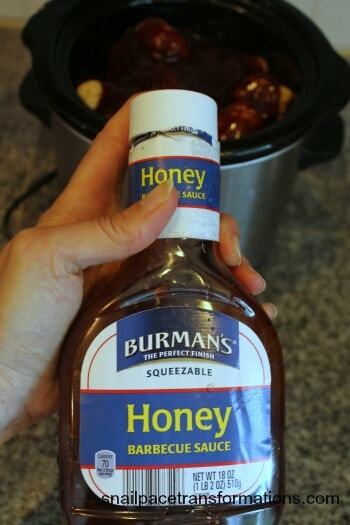 I dump the bag of frozen chicken bites (mine is 1 lb 8 0z) in my crock-pot and cover them with Honey BBQ sauce. 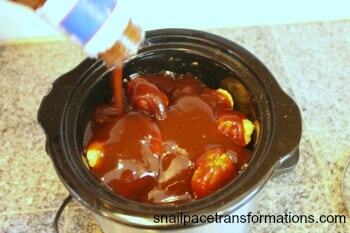 I use a smaller crock-pot (ours is similar to this one), but a larger sized one would work just fine. 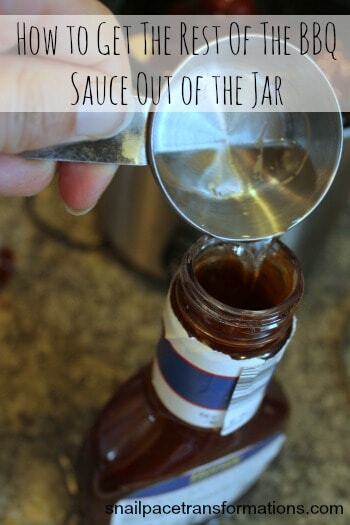 You can use whatever kind of BBQ sauce you want. Personally, I like one with a bit more kick, but my husband likes the honey one. 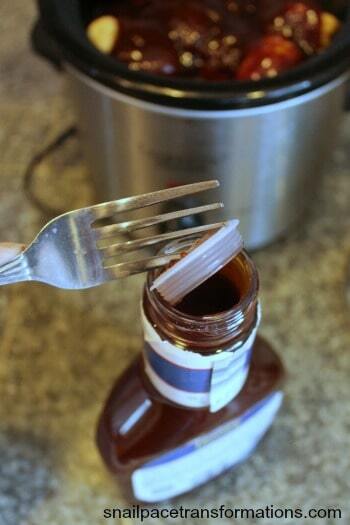 Here is a tip for getting out the last of the BBQ sauce. Step One: Use a fork to pry off the lid. Step two: add about a 1/4 cup of white vinegar. Step 3: place the cap back firmly on the bottle, and shake until the sides of the container no longer have sauce on them. Step 4: pour the contents over the chicken bites. 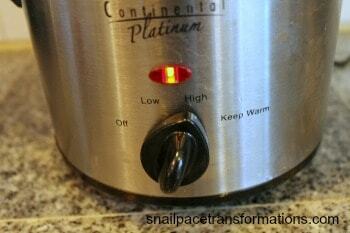 Turn your crock-pot on high for 2 hours and then turn it down to low for one additional hour. These babies come out tender and dripping in sauce. WARNING eating them with your fingers is incredibly messy, so I prefer to eat them with a fork. Leftovers make great salad toppings. 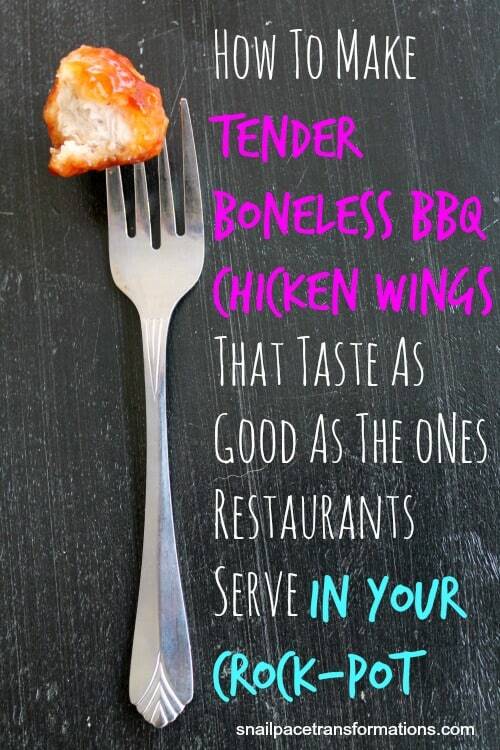 And yes, you can find chicken bites in the freezer section that already come in BBQ flavor, but I find that doing it yourself with plain chicken bites and a bottle of BBQ sauce tastes much more like the boneless chicken wings you get in restaurants. Oh Honey! These little bites look fabulous. We would lick our plates clean. Thanks a million for sharing with us at Weekend Potluck. Looking forward to what you share the next time. They are really good! And thanks for hosting Weekend Potluck! what sized crock pot did you use? can’t wait to make these, hopefully tonight! It is a medium sized one and it fill it to the brim but a larger one would work of course. No, they are not soggy. I think they could get soggy if you left the cooking too long though. Yes they are breaded and it doesn’t matter what brand you use, I have used the ones from Aldis and Ruler Foods. Probably, I have used a Kroger brand before too and I think it was called bites. Chunks might work, so might boneless wings, as long as they are a breaded product. My husband one made them with the breaded boneless chicken strips once and they still turned out although not as easy to eat. Are the bites you buy precooked? 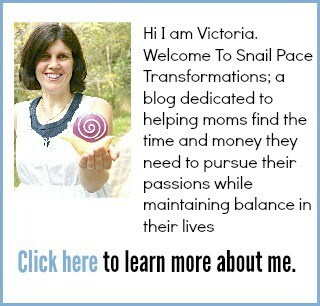 Do u put them in the crock pot while still frozen? Yes they are pre-cooked and yes I put them in the crock pot while still frozen. Thank you for this recipe. I told my husband about this and we are going to give it a try since he loves Buffalo Wild Wings. Your welcome. I hope you like it. The instructions are right high for 2 low for one. I suppose you can. We have done chicken strips before and they turned out great too. Can I use the T.G.I. Friday’s Buffalo Style Sauce Boneless Chicken Bites, 15 oz that you can get at Walmart? I assume from the description that these already have sauce on them? Which if they do I guess you could but you wouldn’t need sauce, if they are already flavored. I am making about 10 lbs for a party. I have a big enough crockpot to hold it all. Do i need to adjust the recipe? You might need more than one bottle of BBQ sauce to cover it. This turned out good! I used 2/3 of a bottle of bbq sauce and 1/3 of a bottle of hot wing sauce (I used BWW brand). Just an FYI, I used a large slow cooker and I on needed the 2 hours on high (no time on low). They were definitely cooked! Then switched it to warm until we were ready to eat. Do you still use the Vinegar if your making them buffalo?